Squat is a type of strength training that pertains to full body training, focusing primarily on the hip muscles, thigh muscles and buttocks. As well as strengthening the bones. There are various types of squats, but these five are among the most basic and easy ones. When doing the pile squat, stand with your legs a little wider than shoulder-width apart. Hold something that has weight, like a dumbbell with both hands. Make sure to keep your head and back straight. Then start lowering yourself slowly into a sitting position with your thighs parallel to the ground. Your weight should be on your heels as you stand back up. Repeat this for 20-25 times. And as you get more familiar with the exercise, you can hold heavier weights. The single- legged squat, otherwise known as the “pistol” is a type of squat where you balance yourself with one leg whilst the other one is extended away from your body. This is how you do it; extend your arms out in front of your body. Extend one straight leg in front of you as high as you can whilst balancing on the other leg. With your back straight and your head up, make sure the knee of the balancing foot is behind its toes as you squat down as far as you can go with the extended leg. Stand up straight and repeat the exercise for about 20-25 times. Because of the position in which the weight is held during this type of squat, it is dubbed ‘goblet’ squat. You hold the weight against your chest, under your chin. Make sure your feet are shoulder-width apart. Go down in a sitting position with your back straight and your chest up. Your knees should be out. Shoot back up and repeat 20-25 times. Just like all the other types of squats, you need to plant your feet about shoulder-width apart. Get below the bar and bend your knees slightly. Your feet should point outward to give you a better grip on the ground. Your knees should be behind your toes. Place the bar over you trapezius muscles, not your neck. Hold the bar with your hands at a comfortable distance and lift from the rack. Take a step away from the rack and go down in a sitting position with your back straight. Contract your abs and keep this position for about 3-5 seconds. Lift yourself back up and repeat about 20-25 times. The plyometric squat doesn’t require any weight. Make sure to not add any weight to your body when doing it. 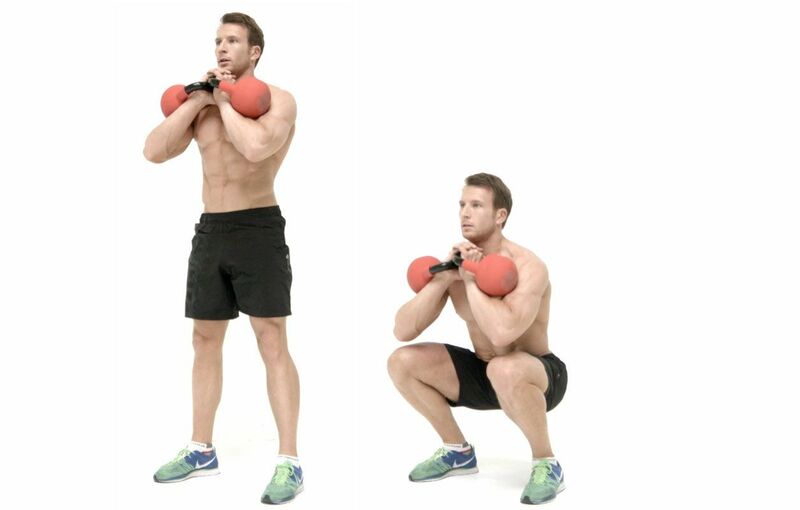 Stand straight with your legs together and squat to the ground with your hands stretched out behind you, then quickly jump from your squatting position with your hands extended upwards. Jump as high as you can then come back down to your previous standing position. Repeat two more times, then take a rest for about 3mins. Begin again. If you find it difficult to do these squats on your own, you can always go to a gym and get the help of a gym instructor. Posted on 10th October 2015 by Ida S.. This entry was posted in Home Workout, Squats and tagged health and fitness, squat. Bookmark the permalink.